Interesting enquiry received from Mike Statham (UK) for whom we have provided much help in identifying cars owned by the Insole family. They are planning a booklet on Insole cars. 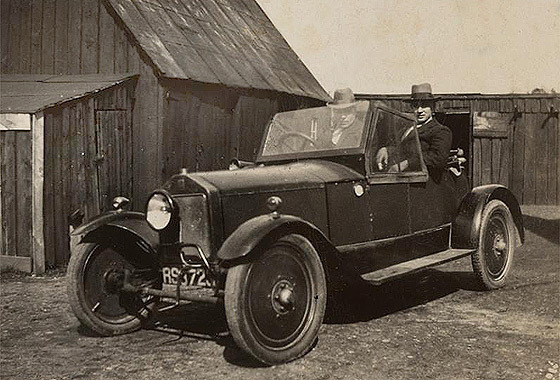 The first person known to have owned a car was Richard Grainger O'Callaghan. It was mentioned in the press that he ran over and killed a boy in Dublin in 1903. He got 3 months for manslaughter. 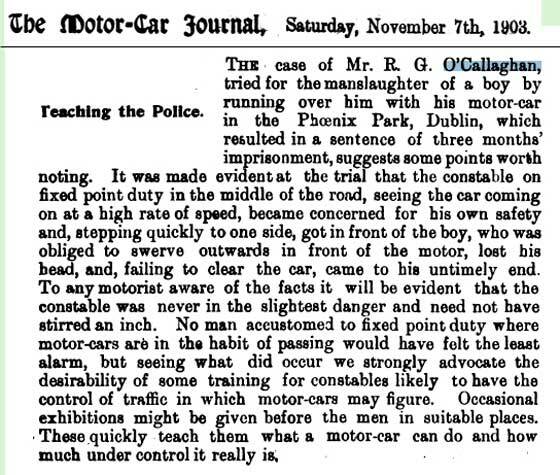 Further details in the Motoring Annual of 1903; do we have access? -- Found press cutting but no access. HELP !! Another of a number of interesting period photos sent by Alun Pugh of Leeds (UK) of a car parked outside Castle Grove, Headingley Leeds, he would appreciate identified. A posh residence owned by John Kirk with chauffeur Harry Hutchinson. Plate was U6? -- U-6 was a 1902 Belsize 12HP owned by E. Hepper of Heddingley but not of Castle Grove. 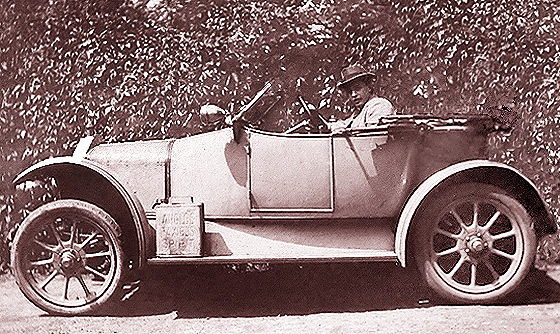 Photo could be Castle Grove but the car is a French cca 1903 De Dietrich 24hp Tonneau designed by Ettore Bugatti, who also designed types 3'4'5'6'7. Lovely photo received from Karen McClure (USA) of a car being driven by her grandfather Ellis Robertson taken in 1955 at Stanley Steamer event Lakeville, Connecticut. 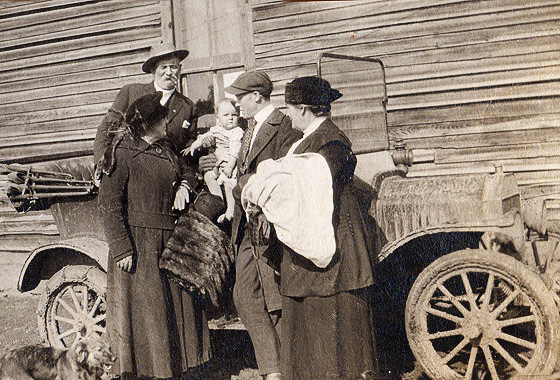 Her mother's grandfather, George Bryant Robertson of Keene, NH, was agent for Stanley Steamers in 1904. In 1908 he went to the Philippines as Superintendent of Automobile Service for the Philippines and to help develop/offer transportation via Stanley Steamers from Manila to Baguio (See our major ZigZag article). 56 emails received from Chris Thomas (UK) so superkeen or email got stuck on Send. Could we identify photo of great grandfather Richard James Harden in front of his house which is close to the village of Clare in Northern Ireland. He died in 1918 so it is obviously before that. -- No registration visible so photo is possibly pre registrations, so 1904. 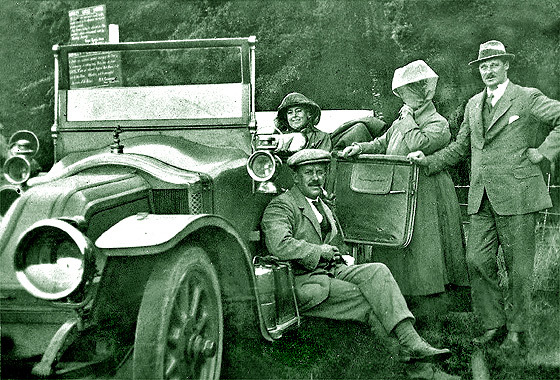 Car is the Birmingham built cca 1904 Wolseley 6HP Light Two-seater while Herbert Austin still at Wolseley. Soon after became Wolseley Siddley. Interesting period photo sent in to the Rootschat Forum (UK) some time ago asking for dating and identification. No identification has been made so far. -- We occasionally come across these unidentified photos while investigating other enquiries, and keep for later identification. Registration seems DU 2356 which is Coventry CBC but no dating info. 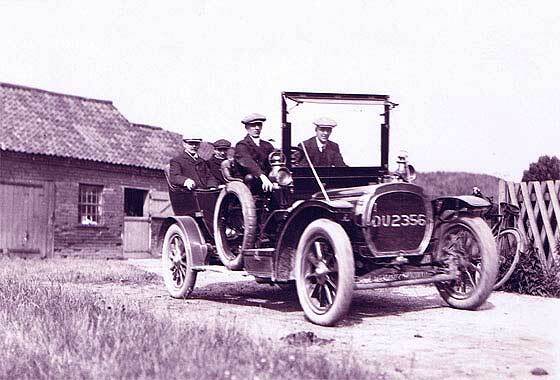 Polished wheel hubs, transverse front spring , and scalloped bonnet and rad, all suggest cca 1907 Deasy 24HP Tourer. Pre Siddeley-Deasy 1912. 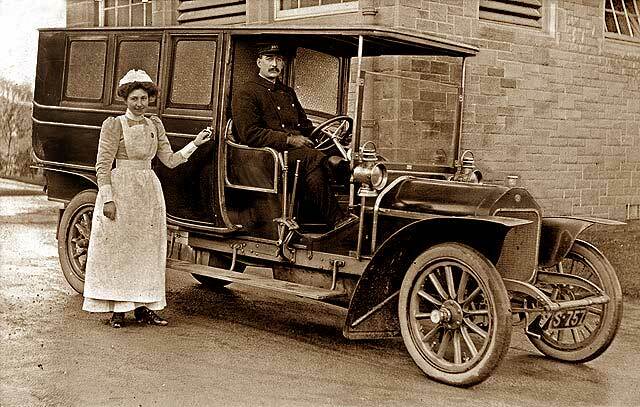 While researching we chanced on previously helped EdinPhoto website where a 1907 photo headed 'First Motorised Ambulance' was posted by Ross (UK). What is the make? 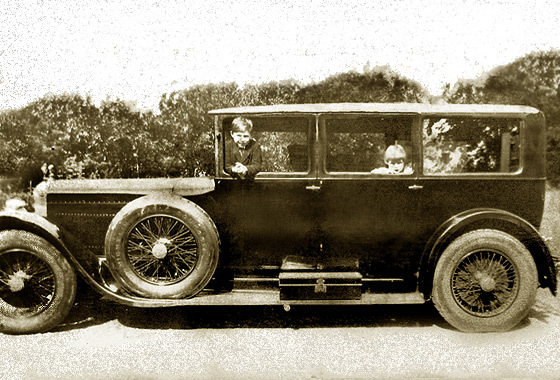 -- Lovely limousine-like vehicle built by the Vickers 'Wolseley' organization which had just parted with Herbert Austin. 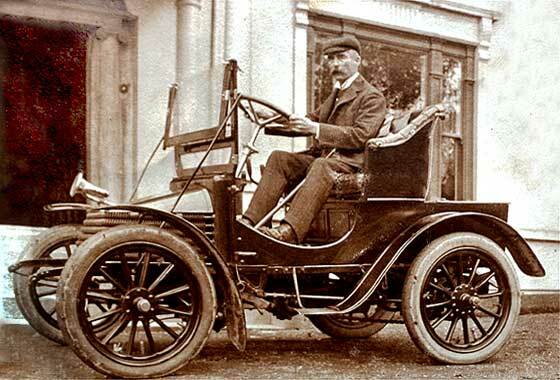 Vickers appointed JD Siddeley as GM so name of car changed in 1906 to Wolseley Siddeley. This is quite a large vehicle with three side windows so probably cca 1907 Wolseley Siddeley Limousine, poss 40HP. Our regular contributor Mark Dawber (New Zealand) is trying to identify the vehicles posted on New Zealand Facebook page. What is the make, model and year. -- Distinctive circular radiator with large indentations is a feature of the French Paris based manufacturer Chenard-Walcker who were the first ever winner of the Le Mans 24 hour in 1923. This one has the handwheel on the side fitted to many Taxis for Paris which suggest this could be a cca 1907 Chenard Walcker 14HP Landaulette. While researching we chanced on previously helped EdinPhoto website where a photo entitled 1909 Delaunay Belleville had been posted by Bill Hall (UK). -- Sorry car depicted is not a Delaunay Belleville, but a Renault. Both are French manufacture but differ considerably. Delaunay Belleville is distinctive having cylindrical bonnet and forward circular radiator, the Renault has an alligator bonnet and radiator adjacent to the windscreen. 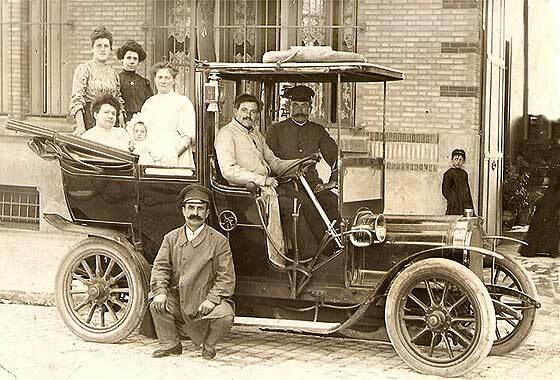 Photo is cca 1907 Renault 14 CV Limousine. 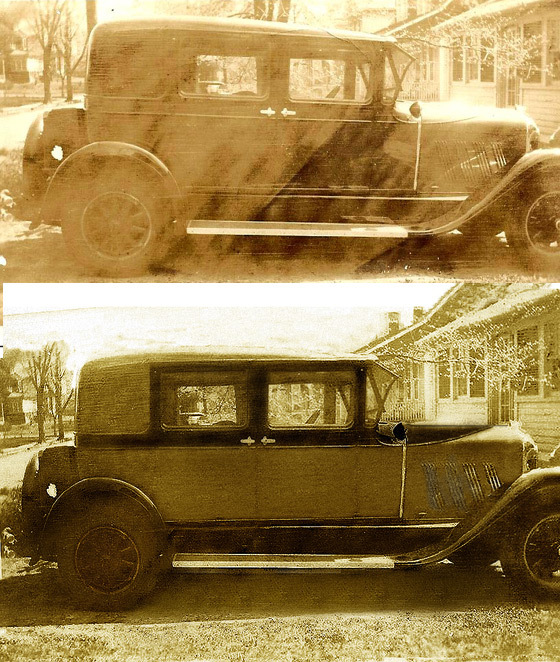 Our regular contributor Mark Dawber (New Zealand) is trying to identify the vehicles on two photos sent to him by Tim Martin from USA saying - any ideas on this car? -- We have had one of these recently but my cross-reference system failed, so our Ariejan Bos kindly reminded me both are Reinier; this is a (rare) racer cca 1907 with its slightly oval radiator and short filler tube. 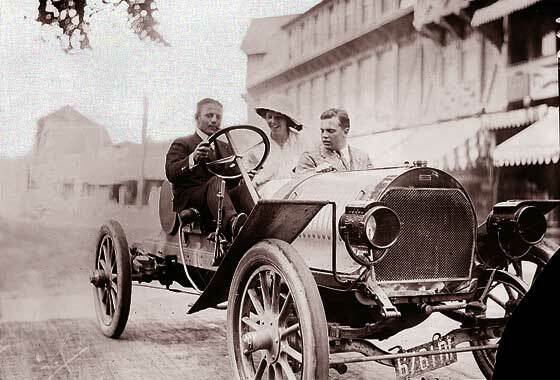 Rainier has a modest racing history in 1908 Long Island Motor Parkway and 1909'10 Brighton Beach 24 hour . 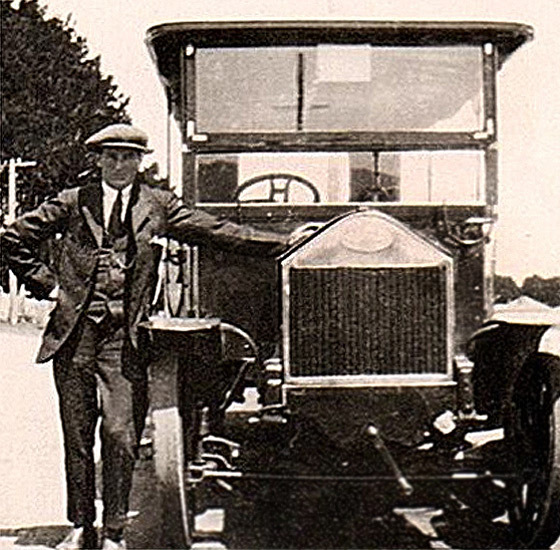 Our regular contributor Mark Dawber (New Zealand) is trying to identify the vehicles posted on New Zealand Facebook page as first taxi in 1910 Wanganui. What is the make, model and year. -- Another with a 'circular' radiator header with a small bump on the top. This is a feature of the originally Swiss, later French, manufacturer on the Swiss border Zürcher & Lüthi, later 'Zedel'. It is known that a cca 1909 Zedel Taxi, no 90, was operating in 1910 Wellington driven by one Geoge Fernandos. 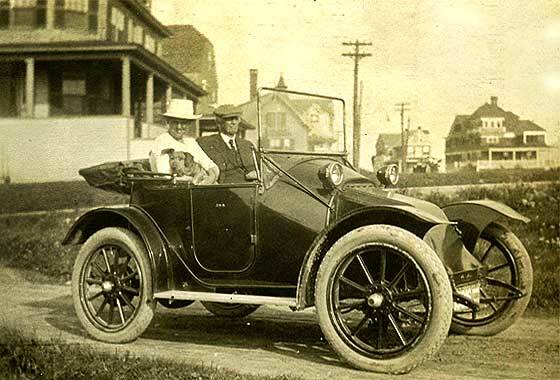 Our regular contributor Mark Dawber (New Zealand) is trying to identify the vehicles on two photos sent to him by Tim Martin from USA saying - any ideas on this car? -- We have had one of these recently but my cross-reference system failed, so our Ariejan Bos kindly reminded me both are Rainier. 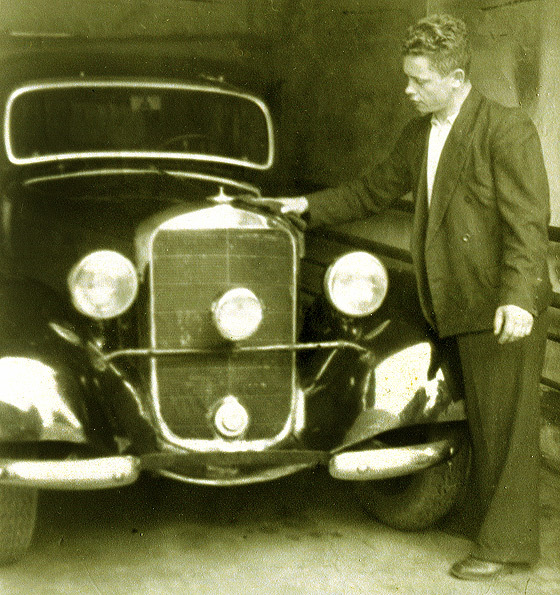 This photo is evenly rarer than the previous Rainier as it may show one of the last cars built by Rainier. It is a 1911 Model F Regulation or Special Touring, only model with this type of mudguard. Our regular contributor Mark Dawber (New Zealand) is trying to identify the vehicle on a photo of a group of people and a car from the Auckland War Memorial Museum collection. Renault built many models at that time. -- Indeed many models and difficult to tell apart. This is a medium sized car with wavy longish scuttle, no petrol filler, gas lighting, and has rounded profiles to radiator. This suggests a cca 1911 Renault CC Tourer, which was a 14 CV model with a four cylinder 3560cc engine. Our regular contributor Mark Dawber (New Zealand) is trying to identify the vehicle on a photo sent to him by Tim Martin from USA saying - any ideas on this car? 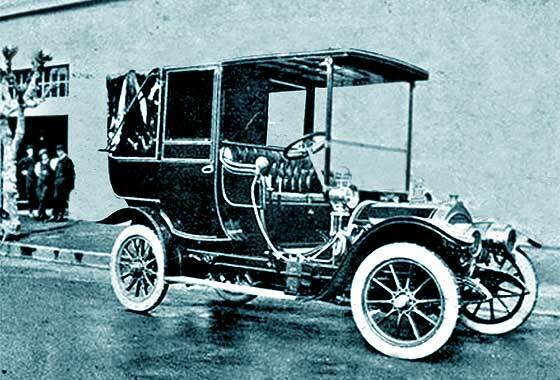 -- Large car with a cylindrical bonnet with a circular radiator is normally indicative of the prestigious French manufacturer Delaunay Belleville; - the car of the Tsar. This one has a longish bonnet with a wrap-round scuttle fuel tank so is either a cca 1912 Delaunay Belleville HB4 or HB6 Tourer, the difference is number of cylinders & cc. Our regular contributor Mark Dawber (New Zealand) is trying to identify the vehicle on a photo sent to him by Tim Martin from USA saying - any ideas on this car? -- We had identified this as a cca 1912 Hupp Yeats Regent Torpedo Roadster at about the same time that he advised ID as Hupp Yeats. 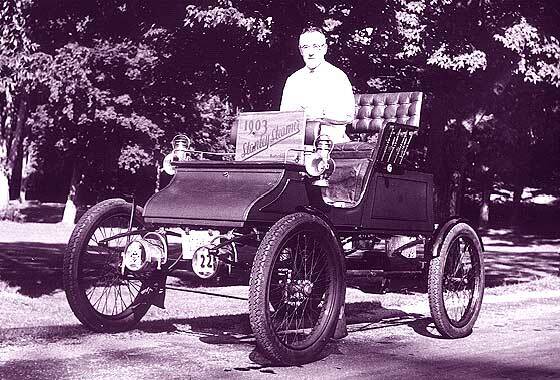 This is an electric car made in Detroit by Robert Hupp previously of Hupp Motors and subsequently RCH. About 1000 cars made to 1914. 70-90 miles per charge, 17-20 mph and cost USD 1,650. Our regular contributor Mark Dawber (New Zealand) is trying to identify the vehicle on a photo from the Kennedy bus and car fleet. Looks 1920s English maybe? Could it be one of their Lacres? -- In my system I have a 1912 picture of an identical looking Manchester registered 'Lacre' on solid tyres and chain drive, and couple of OZ photos showing cca 1912 Lacre busses with an oval badge, and have the drag link in front of the axle. Later vehicles had large lettered Lacre logo. Chain drive to 1922. 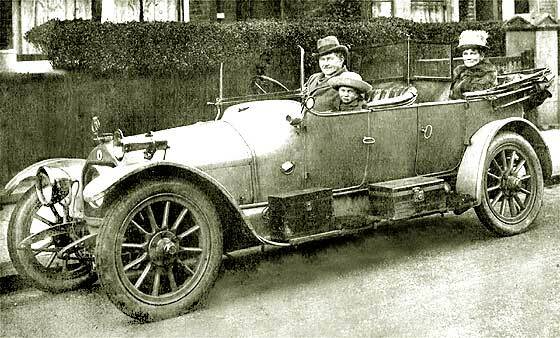 Interesting period photo sent in to us by Glenda Richardson (UK) which she had shown to her elderly neighbour and after spending some time on the interet, he wonders if it is a 1914 Humberette. It does have a 'mascot', but I do not know if this is original to the car. -- Good try but regret not a Humberette. No registration visible to help with accurate dating but from the humpy radiator and steepish slope of the scuttle, and electrics, this is a cca 1913 Singer 10 HP Two-Seater, 1096cc four. Interesting period photo sent in to the Rootschat Forum (UK) some time ago asking for dating and identification. No identification made so far. -- We occasionally come across these types of photos while investigating other enquiries, and keep for later identification. No registration is visible to help in dating but we are relatively sure this is a cca 1914 Darracq 16CV Tourer. Made by the Paris end of the UK Darracq Co which was then under the management of Owen Clegg (ex Rover 12). Another interesting photo received from Mike Sanders (USA) of a car we confirmed as a 1916 Ford Model T - outside of Lewistown, Montana. 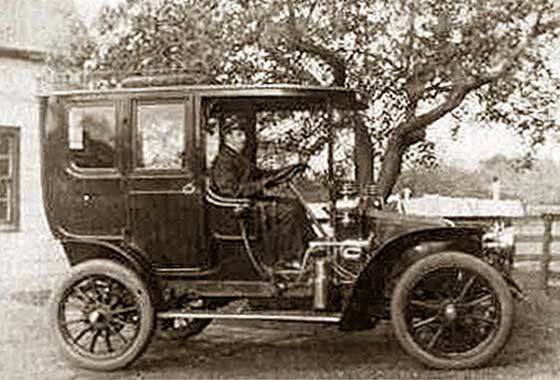 -- On Help Page 138 we confirmed it is a cca 1916 Model T Ford with angular rather then new rounded bonnet. What is interesting from this photo is Granny's fur, and that car is fitted with chains on rear wheel and, visible through front wheel, is fitted with accessory Hassler Spring Shock Absorbers (Rebound Check). Obviously very determined drivers. Our regular contributor Mark Dawber (New Zealand) is trying to identify the mystery British (?) light car shared on a Facebook page from Auckland. Any ideas? -- Difficult one which has a Wolseley type rad but with a rectangular badge and smallish body, and a forward mounted tubular front axle. Registration is Scotland so John Warburton thinks this is a cca 1922 Rob Roy 8'10HP twin-cylinder Model K1 Tourer made in Glasgow by Kennedy, sharing engine with 1921 Kingsbury, London. 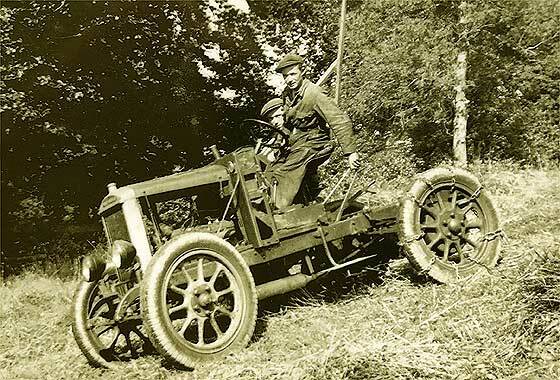 Quite a grainy photo received from Dean McCarthy of Dublin (Eire) hoping we will be able to identify photo of his Great Grandfather's car which he believes is a Delage. If so, can we advise model and year. -- We have enhanced the photo and can advise that from the exposed rivets of the bonnet hinge this is indeed a Delage. Radiator top is unclear bur the squarish shape of the bonnet and the angular shape of the rear top of the roof, this would be a cca 1924 Delage DI Limousine. 56 emails received from Chris Thomas (UK) so either superkeen or email got stuck on Send. Could we identify photo of a tractor on great grandfather Richard James Harden's estate in Clare in Northern Ireland. He died in 1918. -- So after after his death. This is not a 'tractor' but a lorry chassis converted to agricultural use, hence chains on rear car wheels and two side-by-side seats. LHD? Low headlamps so a cca 1925 Morris Commercial T type 1 ton van chassis, possibly slightly shortened. 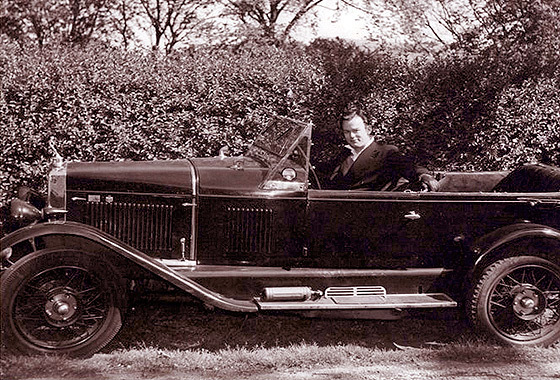 Very poor photo received from George Nuse (USA) hoping we will be able to identify this car that belonged to his grandfather in probably the very late 20's or very early 30's in the U.S. Note distinctive ridge running over the hood, louvers and "wind wing" next to the windshield. -- We have considerably enhanced the photo and can advise this is indeed an American car manufactured in Auburn Indiana by successors to Eckhart taken over by Cord. This is cca 1926 Auburn 6-66 Brougham. 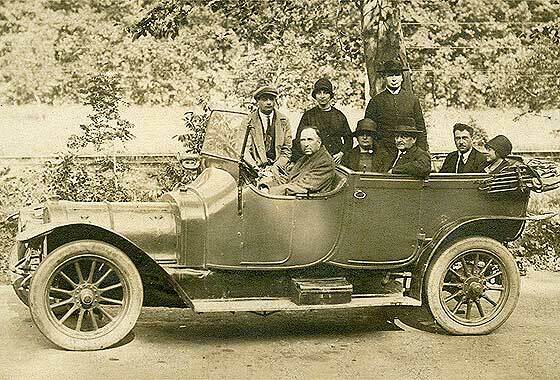 Lovely photo sent in to us by Roy Jones, Rousdon (UK) of a car he would appreciate identified. It was owned by his brother-in-law William Allsworth in Folkestone and was sold in about 1964. He is writing family history so would be interested to know what it was. -- A Morris by any other name, - a MG ! This is cca 1927 MG 14'28 Sports. 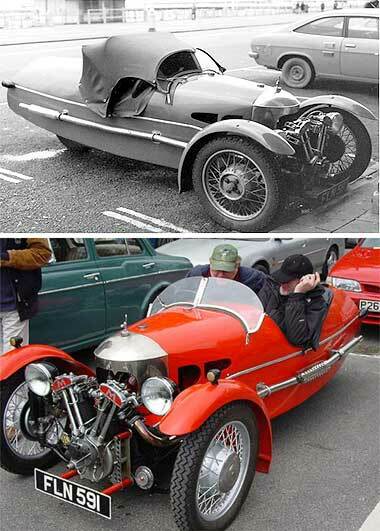 Second of the famous line of MGs made by Morris Garages, who started modifying Morrises having tuned engines and different bodies. 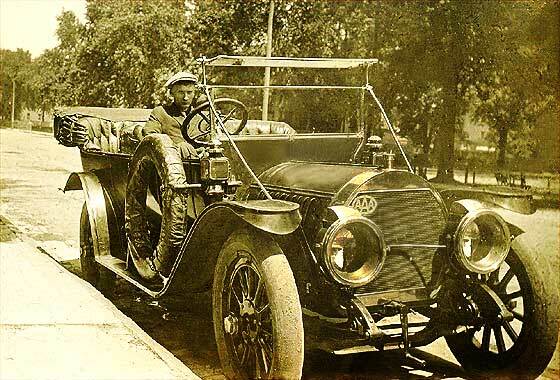 First MG was 1924. We have an interesting photo received from Marc Heindrijckx (Belgium) who had bought some old slides on E-bay, including slide of a Morgan 3 wheeler, poss taken in Brighton at London To Brighton in the 70's. Doing some research he came across our website where this same Morgan is shown as owned by one of our members. Was it his then already? -- Yes our member has been owner of this car, a 1939 Morgan Super Sports 990cc Matchless since 1961, so it had been him driving. Another interesting photo sent to us by Andrew Kostin from Moscow (Russia) who is a collector of old photos. Can we identify this car with Soviet driver in 1950-1951 while working in the Soviet Military Hospital in Beelitz (German Democratic Republic)? -- The car is German, has a missing emblem on the bonnet top and has a non-standard badge bar holding a spot lamp. Split bumper so pre 1952 upgrade. Not enough car to see details/doors, but this is cca 1949 Mercedes Benz 170 V Saloon.